Schlumberger writes somewhere that if the students brought up amid the serene beauties of the Princes Islands in the study of the ancient fathers do not become accomplished priests, it can only be because their souls are vide d’aspirations, incapable d’essor. 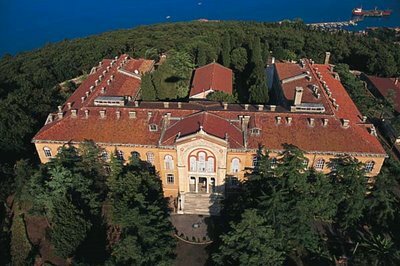 Such a sweeping judgment is probably unfair to any academy but it remains true, that the mystic, natural beauty of those jewels of the Marmara, the Princes Islands and the magnificent position of the school, the unforgettable views from her terrace and from her garden walks and hill (Umit tepesi, the hill of hope) combine mysteriously with the daily round of services, study, walks, and with the relations between teachers and students and the Centre of Orthodoxy, to form an unrivalled means of producing what is called a Church phenomena. The school has always purposed to be principally a training centre for clergy who will administrate and preach. She does not seek to produce professors and research workers in the history, literature and philosophy of religion, but rather theologians and clergy who will be preachers and teach the people of the Church. In 1930, for the first time since the interruptions that followed the Great War, she gave forth her fruits in ordained men who had completed their seven years’ course after the re-opening in 1923. In the four years since then, her former pupils have gone forth in the Church’s service to occupy a great variety of positions. Among those who finished their studies in and after 1930, are the Chief Secretary and Under-Secretaries of the Holy Synod and the Librarian on the staff of the Œcumenical Patriarchate, the chaplain in Berlin and one of the Parochial Clergy in Australia, as Archimandrites, and the Archdeacons of four Metropolitan dioceses, all of these last being also travelling preachers. The Archdeacon as, the principal deacon on the staff of a Metropolitan diocese, in charge of matters of preaching and often the representative of the Metropolitan bishop for the supervision of the lower clergy in general, holds a very important position with great responsibilities. There is a diocese where the Archdeacon, who very recently left Halki, is the only official of the diocese and when the Metropolitan is away is the only cleric of theological education, very nearly the only preacher, with all the accompanying responsibilities for 9,000 Orthodox people in scattered villages. Yet Halki is not and cannot be only a “staff college.” Since 1930, among her alumni are the librarian of the famous monastery of St. Catherine on Mount Sinai, a deacon-schoolmaster in the U.S.A., and six deacons who are preachers in parish churches in and round Constantinople. One of these belongs to the married clergy. Three more parishes propose to have theologians from Halki as deacons and preachers on their staffs this year. More openings will probably follow. 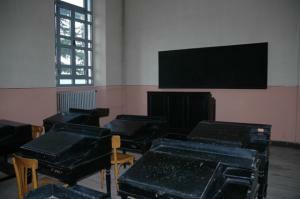 The present number of students is 65. Ten completed their course last year, six will do so this year and fourteen next year. The supply of titles is very satisfactory considering all the difficult conditions. In a previous article, some description of the seven years’ programme of work was given. It is the method of the school to have, in each subject, one recognized set-book, printed or lithographed, which has to be learnt thoroughly for questions in the classes and for examinations twice a year. In Exegetics, however, certain parts of the Bible have to be thoroughly known, with notes dictated by the Professor. But independently of this text-book work the student has also to submit a large number of exercises set to him individually at different times during his course, and at the end of the course he must submit a thesis. This work includes analyses of works of the Fathers and Church historians of the fourth and fifth centuries from Dogmatic Patrological and historical points of view. Exercises are submitted in the Bible subjects, Canon Law and Ecclesiastical Rhetoric as well as in the Fathers and Dogmatic Theology and Church History. 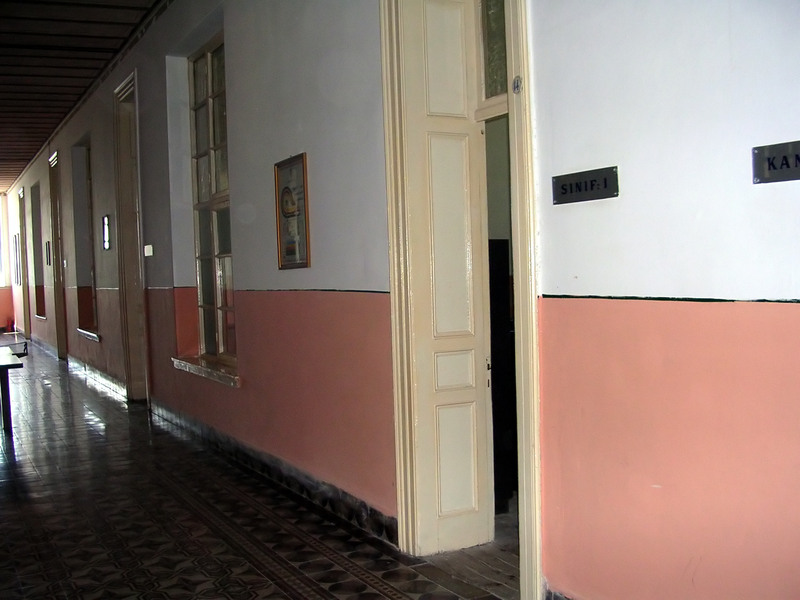 Rhetorical exercises, of which each student performs six in his three years in the theological department, are sermons and must be delivered before the whole school. In the student’s last year at services on Sundays and Holy days attended by the public, the student about to complete his course delivers his two sermons to the congregation. The practice is to write each sermon and learn it by heart. All learn to sing and take turns as singers and readers in the service of the sanctuary in the school church. Some students who desire it and are considered fit are ordained as priests and deacons to serve the school, which is a monastery, while still at their studies. These ordained men and occasionally men not ordained who are approaching the conclusion of their studies, are invited exceptionally to serve and to preach in parish churches. 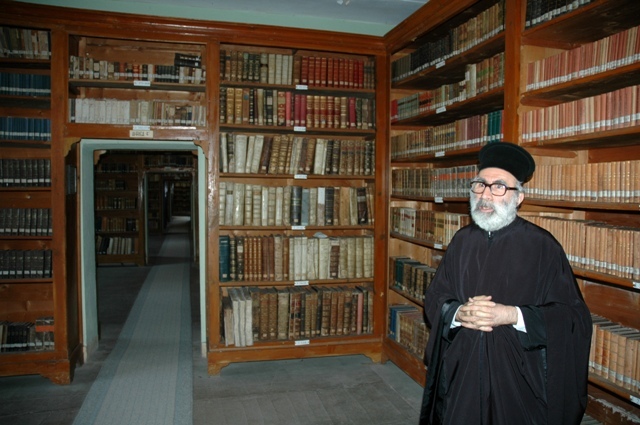 There is a very extensive library in a well-ordered and well-lighted room with a large store of MSS., and a very good supply of valuable Paris and Leipzig publications, including some of the seventeenth century, and a very large amount of the Orthodox periodical literature of the pre-war period. But it has not been possible to supplement it so much in the last few years and in order to fill the gap the “students’ library” has been founded. This is supported by the students’ own subscriptions and supplies modern Greek literature, sermons and periodicals, and foreign literature, chiefly French sermons. Sometimes students give lectures organized by the library committee. I have given two on the Anglican Communion. 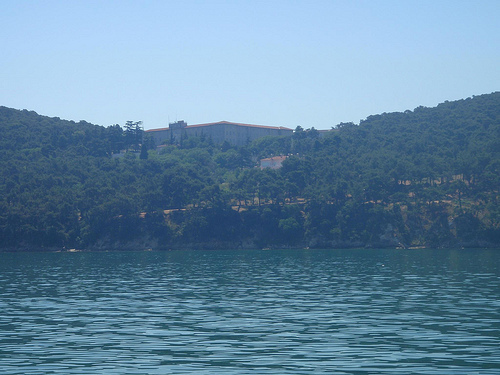 There are three citizens of the United States among the students and one student had an English secondary education in Cardiff immediately before coming to Halki. Two Cypriots also know English. Some are receiving a few English lessons in odd hours but this is very difficult at present. Even Hebrew and Russian have left the time-table since the war. Inevitably in the lower classes there have to be nine hours or ten hours of Turkish a week, including the history and geography of the world from Turkish books. In the theological classes there are five hours of Turkish on the weekly programme. This is a necessary and effective part of the preparation of the majority of the students who are citizens of Turkey and will serve the Church on her soil. But as it is necessary also for all foreign students who intend taking the full course and being examined for certificates, and these come to Halki without knowing any Turkish, that leaves little time or inclination for other tongues except French and some Latin. 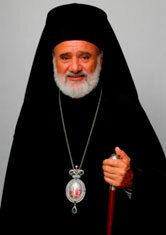 His Eminence Archbishop Stylianos Harkianakis is the Primate of the Greek Orthodox Church in Australia. Born in Rethymnon, Crete (29-12-1935), he studied at the Theological School of Halki, Constantinople. In late 1957, he was ordained to the Diaconate. Upon graduating and being ordained to the Priesthood in 1958, he received a scholarship from the Ecumenical Patriarchate to complete postgraduate studies in Systematic Theology and Philosophy of Religion in Bonn, W. Germany (1958-1966). In order to become a Doctor of Divinity from an Orthodox Theological Faculty, rather than from an analogous western Faculty, he submitted in 1965 his doctoral dissertation entitled ‘The Infallibility of the Church in Orthodox Theology’ [in Greek], to the Theological Faculty of the University of Athens. Upon his return from Germany in 1966, he was appointed Abbot of the historic Patriarchal Monastery of Vlatades, Thessaloniki (14th cent. ), within which he was requested by the Holy Synod of Constantinople to help establish, together with other scholars of the local Theological Faculty, what was to be called ‘The Patriarchal Institute of Patristic Studies’. He soon became the Vice-President of that research centre, a role had for a few months before becoming President. Upon completing his post-doctoral dissertation under the title ‘The Dogmatic Constitution De Ecclesia of the Second Vatican Council’ (Thessaloniki), he became Associate Professor at the University of Thessaloniki in 1969. In the years immediately following, he also lectured at various Faculties and academic institutions, within Greece and Abroad, especially at the University of Regensburg, W. Germany, in 1973. He was unanimously elected by the Holy Synod of Constantinople as Titular Metropolitan of Militoupolis and Exarch of the Ecumenical Patriarchate for Mount Athos in 1970 (residing at the Monastery of Vlatades). He is also a recognized essayist and poet, having published 37 collections of poetry (all of these in Greek and some translated Bilingual editions). For his outstanding contribution to European culture, and after being nominated by the distinguished Philologist of the University of Vienna, Professor Albin Lesky, he received from the relevant Committee the prestigious international award Gottfried von Herder in Vienna, 1973. Then, in 1980, having been nominated by the renowned writer Pantelis Prevelakis, Archbishop Stylianos received the Award for Poetry from the Academy of Athens. The University of Lublin, Poland, conferred on him an honorary doctorate (1985), while the Sydney College of Divinity awarded him its first ever honorary doctorate (2001). In 2005, he was acknowledged as a Professor by an independent academic panel of the Sydney College of Divinity. Archbishop Stylianos is also Dean and Founder (in 1986) of St Andrew’s Greek Orthodox Theological College, Sydney, where he continually lectures in Systematic Theology.